When we think the same thoughts over and over, we create well-worn paths in our brain. The metaphor of a path is more than just a metaphor. It’s a description. We do create neural pathways in our brains. The more we take a particular neural path, the stronger the connections become and the more quickly our brains use that path as a default. The mental image of a path always makes me think of the last lines of Robert Frost’s poem, “The Road Not Taken”: “Two roads diverged in a wood and I – I took the one less traveled by and that has made all of the difference.” Taking the brain path that is less traveled or even creating a new brain path is the way to change thought patterns that are not serving us. Let’s say I have worn a very clear and wide “poor me” path in my brain. In any circumstance that I face, the easiest, quickest path to take is the “poor me” path. Car breaks down—poor me! Economy takes a dive—poor me! Daughter won’t do chores—poor me! Hang nail—poor me! You get the idea. I could just as easily have worn a clear and wide “stupid you” path. Most of the time we glide into thought patterns without thinking. We could be imitating a parent. Perhaps our current thinking is influenced by a set of circumstances in our past. The first step is to ask, “Is this way of thinking serving me now?” It might have been useful when you were a child and under the control of others, but it might not be useful now. Maybe it never was useful. It’s time to take a fresh look. Sometimes an event can put us on a mental path that is keeping us stuck in the past or in a negative way of thinking. Way back when I was in high school, I would obsess over any mistake that I made. If I said or did something that hurt someone’s feelings or embarrassed me or was just plain stupid, I would play it in my head over and over. After a while, I realized that replaying it wasn’t useful. It made me sick to my stomach and kept me on the “I am an idiot” path. I came up with a solution that I learned 30 years later is called cognitive restructuring. First, look at the offending situation. What lesson can you learn? How can you avoid repeating the mistake? Decide on a one-sentence lesson you have learned. Then take the lesson forward and leave the details behind. I will share a particularly humiliating example. In high school, I was head-over-heels for a guy who dropped me and started going out with someone else. I was so hurt and angry. I drove past his house one evening and saw that his car was out front. I stopped. It was unlocked. I don’t remember the details, but I messed up the inside and outside of his car. No permanent damage, but afterward I was so ashamed and humiliated. He had to have known it was me. I acted on impulse out of anger. I acted childishly. Second step: How could I avoid the same mistake in the future? No acting out in anger. I have poor judgment when I am angry. No childish behavior. That wasn’t who I wanted to be. Third step: Create a take-away phrase. Step four: Think about something else. I forced myself to go over my To Do list or started reciting song lyrics, anything to get me off of the path of replaying the event. I didn’t just have to redirect my thoughts once. I had to do it over and over again. The key is consistency and determination. I had to stay off the well-worn path to let the branches, vines, and grass take over and make it disappear. Eventually the path grew over. Today, I can only recall the lesson, not the details. In the time since, I’ve discovered that replacing the offending thought pattern with a thought that creates a feeling of gratitude is even more effective. If you are feeling grateful, you cannot feel any other emotion. It replaces fear, unhappiness and resentment. How cool is that? Way better than To Do lists. The key is to make the gratitude path wide and clear—very easy to follow. Line the gratitude path with images and memories that touch your heart because those have the most power. Then you can call them up easily and take that alternate gratitude path whenever you are tempted to take the one you’ve declared off limits. A friend pointed out that we don’t control individual thoughts that surface unbidden. I guess that’s true to some extent. However, what’s important here is that we have the power of choice. We decide what to do with any unbidden thoughts and how long we let them linger. 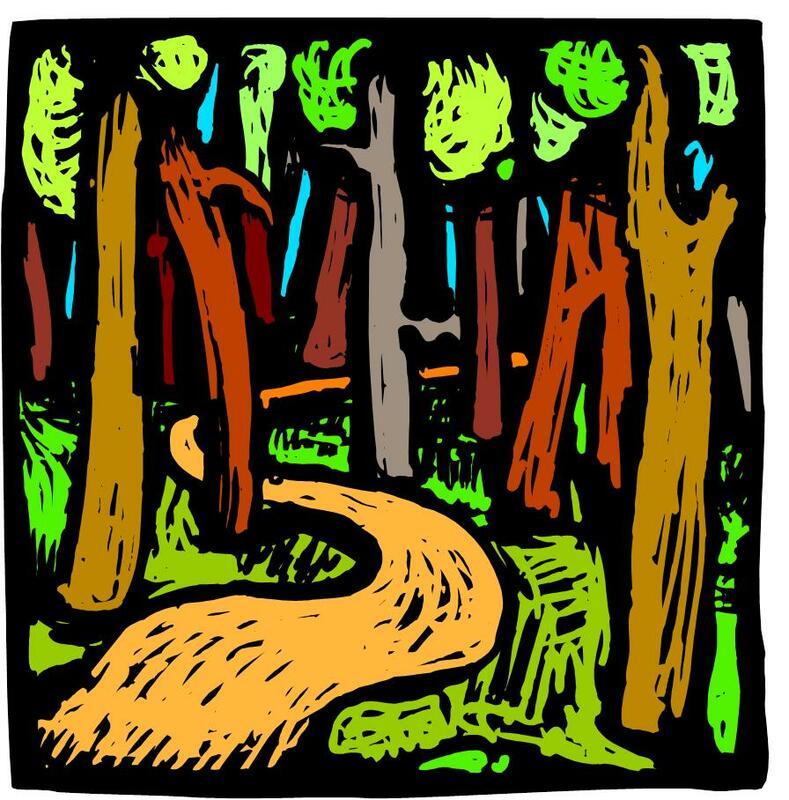 Like the traveler in Robert Frost’s poem, we get to choose our paths. We influence new thoughts by which paths we keep clear and which we let grow over. We choose the tone of our internal dialogue. We choose which paths to cultivate in our minds and through those choices we choose the type of people we are going to be.